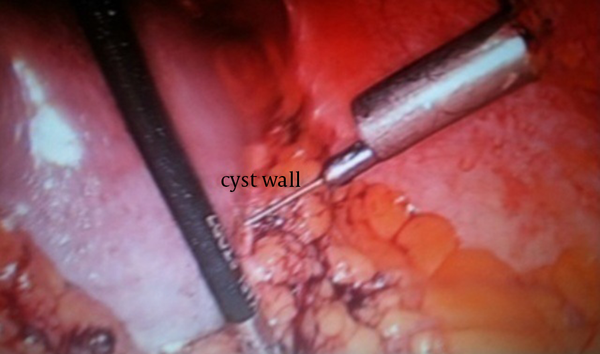 To Cite: Ahmad Khan F, Ali S, Younis M, Ahmad Bhat K, Akhtar M. Laproscopic Enucleation and Omentopexy of A Primary Hydatid Spleen: a Case Report and Literature Review, J Minim Invasive Surg Sci. 2014 ; 3(4):e17108. Introduction: Cystic lesions of spleen are rare. Most of these cysts are parasitic and are caused by Echinococcal infection. Various treatment options for splenic hydatid cyst have evolved over the years. Case Presentation: We report a case of splenic hydatid cyst in a 55-year-old male, managed laproscopically with enucleation and omentopexy. Conclusions: In conclusion, we recommend that laparoscopic spleen preserving procedures should be preferred for hydatid spleen when conditions are favorable and enough precautions are taken to prevent spillage. We suggest the use of aspirator for giving the scolicidal agent and favor the albendazole as an adjuvant therapy to prevent its recurrence. Hydatid disease (echinococcosis) has a worldwide distribution. Liver (75%) followed by the lungs (15%) are the most common sites of involvement in adults (1, 2). Splenic hydatidosis, although rare, is the third most common type of hydatidosis (1, 3). Open splenectomy is considered the standard treatment (4) but in laparoscopic era, laparoscopic management seems to be better and superior. Our patient had a desire of minimally invasive procedure, so we chose laparoscopic management with organ preservation. A 55-year-old male presented with pain and heaviness in his left upper quadrant from two months before. He had no other significant positive history of diseases. On examination his spleen was enlarged, just two fingers below the costal margin. Rest of the physical examination was normal. A trans abdominal ultrasonography revealed a 9.3 cm × 9.9 cm well circumscribed cystic lesion at lower pole of spleen with hyperechoic wavy contents within it. 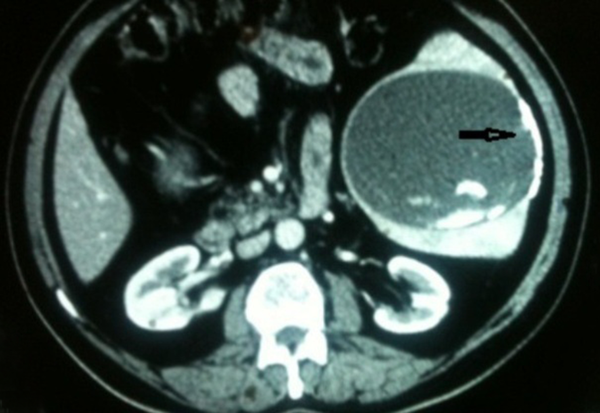 While his contrast enhanced computed tomography (CECT) showed a 10× 10×9 cm3 well defined cystic lesion involving lower pole of spleen with curvilinear calcification and evidence of internal calcified contents (membranes) (Figure 1). Hydatid serology of our patient was positive. In view of radiological features, serology and endemic nature of disease, hydatid cyst of spleen was considered as first diagnosis. To the desire of the patient and favorable location of the cyst, we went for the laparoscopic intervention. Patient was operated in reverse trendelenburg with left up position using four ports. Three 10mm ports were inserted; the first one was inserted in umbilical area for telescope, the second in anterior axillary line two fingers below costal margin and the third one in epigastric region just lateral to midline. One 5 mm port in mid clavicular line two fingers above the level of umbilicus. Apart from the umbilical port, the place of other ports was decided after determining the location of the cyst. Greater omentum was found to be adherent to the lower pole of the spleen. After releasing the omental adhesions the cyst wall became apparent. Aspirator needle was inserted and clear fluid was aspirated out (Figure 2). The color and nature of fluid almost confirmed the diagnosis. After decompressing the cyst (without withdrawing the aspirator) the cavity was filled with 10% betadiene solution using 50 mL syringe. The amount of povidone-iodine was equivalent to the amount of fluid aspirated out. After waiting for 15 minutes povidone-iodine solution was suctioned out through the same aspirator. Cavity opened membranes were removed into an endobag with a hook. The endobag was filled with membranes delivered out intact with the 10 mm axillary port which was then reinserted. A flap of the omentum was fashioned out and inserted into the cavity. The omentum was fixed using a 2/0 catgut suture. Hemostasis was confirmed and tube drain was inserted through a 10 mm axillary port. Drain was kept near the inferior pole of the spleen. The 10 mm ports was closed with vicryl suture and skin clips were applied. Patient had an uneventful recovery. On the first and second postoperative day, drain output was about 50 mL fluid which was sero-sanguinous. There was minimal serous fluid on third postoperative day. Drain was removed on the 3rd postoperative day and the patient was discharged on the 4th postoperative day. Patient is now in his eight months' follow-up. Parasitic cysts of spleen are known to be at least twice as common as nonparasitic variety (5) and in endemic areas 50%-80% of splenic cysts are ecchinococcal (6). Hydatid disease of spleen was first described by Berthelot (1791) (7). The most probable routes of primary hydatid cyst of spleen include arterial route. After escaping from liver and lung circulation, the parasite lodges in spleen. Another route is the venous route; the parasite may bypass liver and lung through portal circulation (8). Systemic dissemination or intra peritoneal spread following ruptured hepatic hydatid cyst may usually lead to secondary hydatid spleen (1, 9). The diagnosis mainly depends on imaging modalities, mostly abdominal ultrasonography and computed tomography. The combination of serological tests and imaging characteristics indicate the correct diagnosis in most cases (10, 11). The definitive treatment guidelines cannot be precisely laid down, as it is a rare disease. The management of splenic cysts has continued to evolve over the years. Open splenectomy has been considered to be the gold standard treatment for the hydatid spleen, even in recent years (4). In the laparoscopic era of the growing experience and new developments of the technical instruments, laparoscopic management has evolved to be more feasible and superior. The possibility of anaphylactic reaction and recurrence due to spillage of fluid into the peritoneal cavity is the main hurdle which has made surgeons reluctant for laparoscopic intervention (12). Those concerns have not been proved in reported laparoscopic series (13). Our technique of giving scolicidal agent through the aspirator, without withdrawing it minimizes the chances of spillage. A retrospective study done by Polat et al. (14) compared open and laparoscopic hydatid cystectomy. There was no recurrence of the cyst in any patient at least 24 months after the operation. But the morbidity rates of laparoscopic and open approaches were 14.2% and 33.3% respectively. Laparoscopy is beneficial to the patient in terms of early recovery, minimal postoperative pain and better cosmetic appearance (15). Organ sparing procedures should always be performed to avoid OPSI, and great mortality rate of over 50% (16). Atmatzidis et al. compared splenectomy and spleen preserving surgery. The study showed no significant increase in recurrence and postoperative complication rate between the two surgical approaches (17). Most of the other studies that also show recurrence rate after total splenectomy, do not differ significantly from spleen preserving surgery and complication rates are also comparable (17, 18). Medical treatment with albendazole as an adjuvant therapy should be used to minimize recurrence in case of spillage or occult cysts (19-21). Administering albendazole before surgery may facilitate complete removal of the germinal layer, as also shown by a study (22). It stabilizes cysts, decreases tension inside the cyst, and decreases anaphylaxis and recurrence (23). In our patient we started albendazole one week prior to surgery and continued it for three months with a gap of one week in each month. We have experienced a very low recurrence rate by using combined medical and surgical modalities (24). In conclusion, we recommend that laparoscopic spleen preserving procedures should be preferred for hydatid spleen when conditions are favorable and enough precautions are taken to prevent spillage. We suggest the use of aspirator for giving the scolicidal agent and favor the albendazole as an adjuvant therapy to prevent its recurrence. We thank our theater team including anesthesiologists and technical staff. We are highly thankful to head of the department of surgical gastroenterology for his kind encouragement and support. Authors’ Contributions: Faroze Ahmad Khan gave the concept and wrote the manuscript. Mohammad Younis, Khurshied Ahmad and Mehmooda Akhtar contributed in preparing the manuscript. Sadaf Ali did the critical revision of the manuscript for important intellectual content.